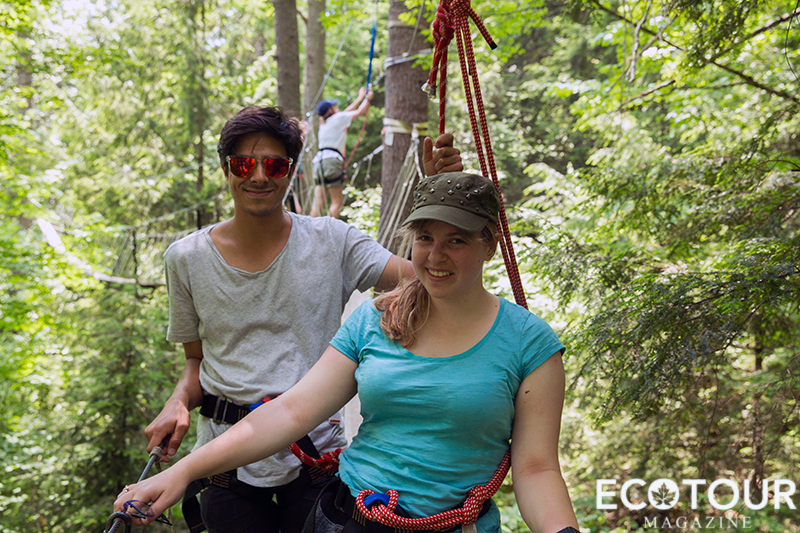 Are you ready to experience one of the world’s longest treetop tours, with over half a kilometre long of winding boardwalk between giant White Pines, 10 to 20 meters above the forest floor? 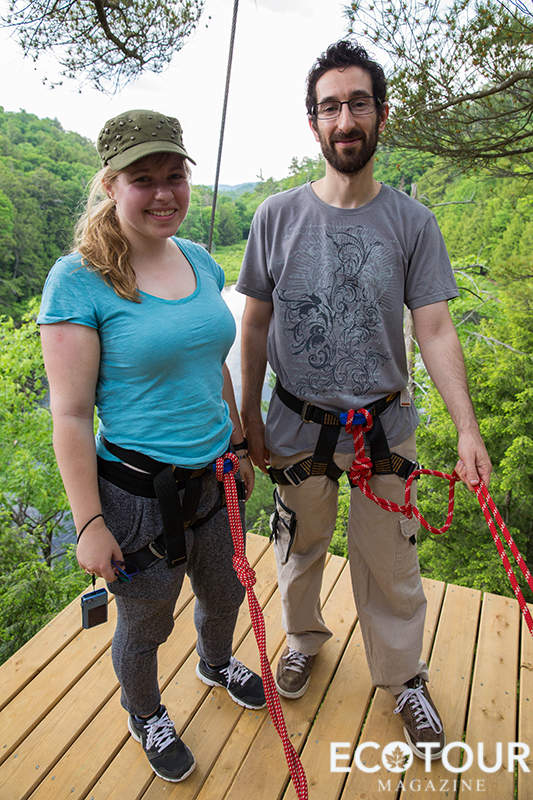 We met our guides, Cameron and Ines, at Basecamp, Haliburton Forest’s meeting headquarters, where they greeted us, as we hopped into the company van to go on our treetop tour. 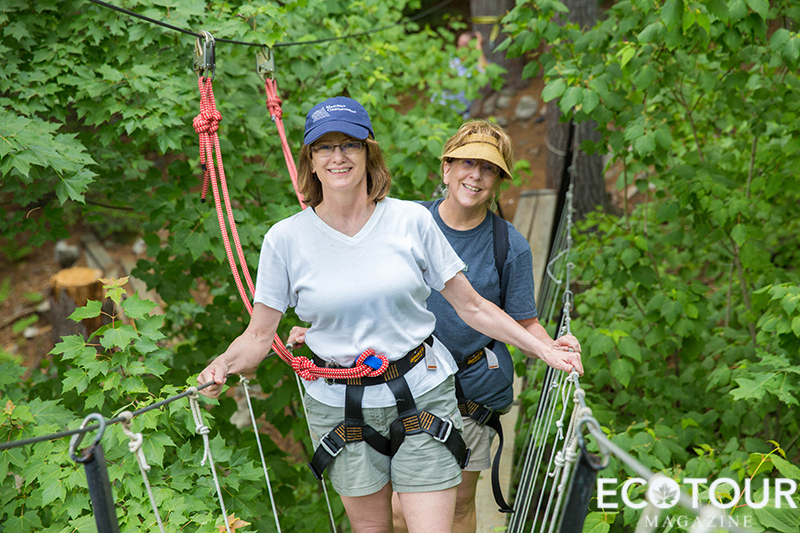 From there, our guides took us on a scenic ride through the forest pathway, introducing us to their hiking-friendly trails, winding lakes, and flowing rivers. 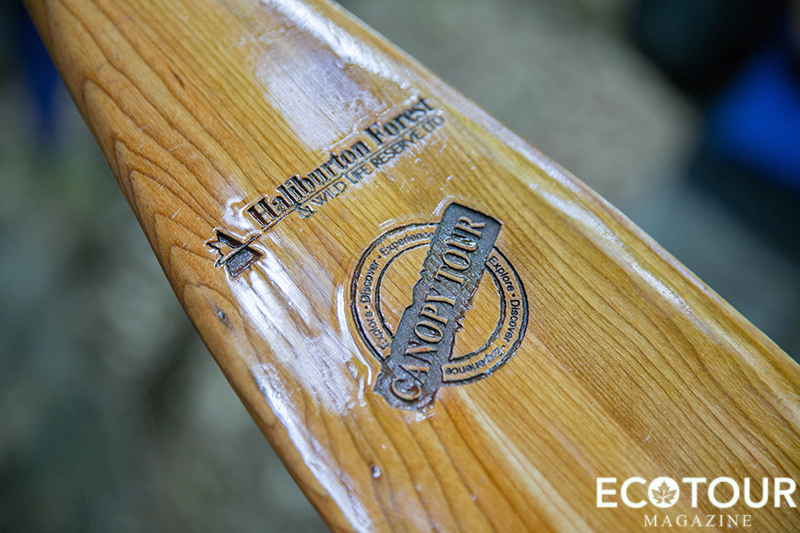 Cameron told us the Haliburton Forest narrative, of how the forest came into the hands of the current Owner, Peter Schleifenbaum. 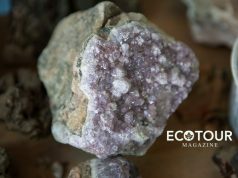 He said that Peter’s father, a German businessman, initially bought the land because he saw an opportunity to convert a depleted forest into a healthy one. 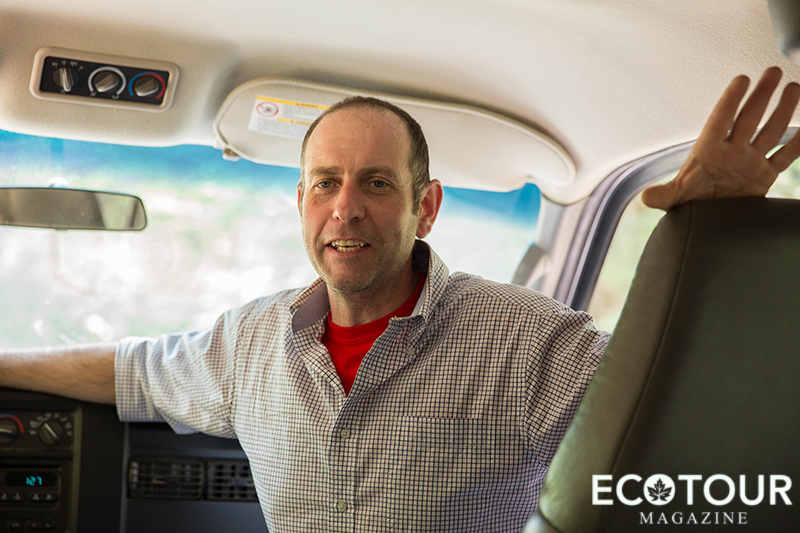 Peter’s father implemented a 100-year management plan to carry out low-grade logging, taking out the poorest quality trees to ensure that only the healthiest would remain. 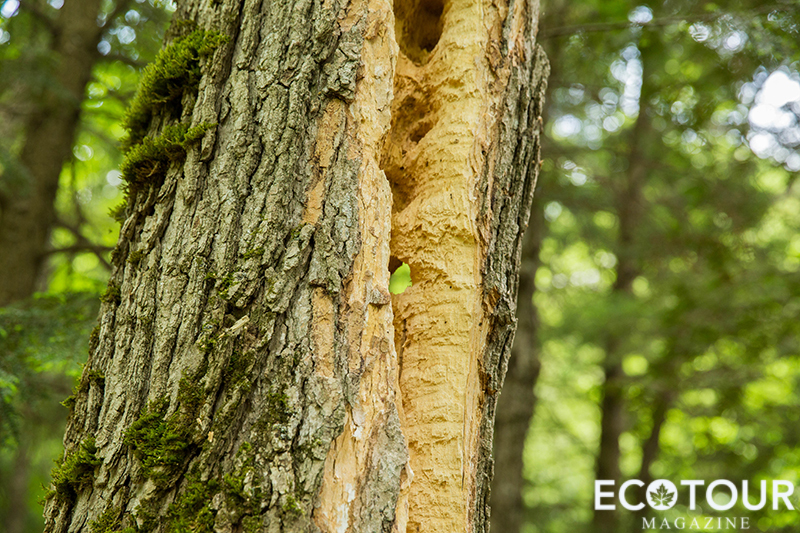 Currently, Peter manages the multi-use managed forest, where recreational sites are balanced with sustainable logging practices to maintain the forest’s 100, 000 acres of private land, 350 lease campsites, 60 lakes, and multiple wetlands. 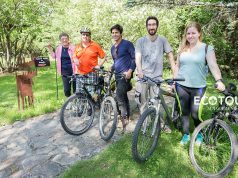 We walked along the shoreline of Pelaw River to our voyageur-canoe ride on Upper Pelaw Lake. People at the front of the canoe set the pace, and everyone else followed their lead. 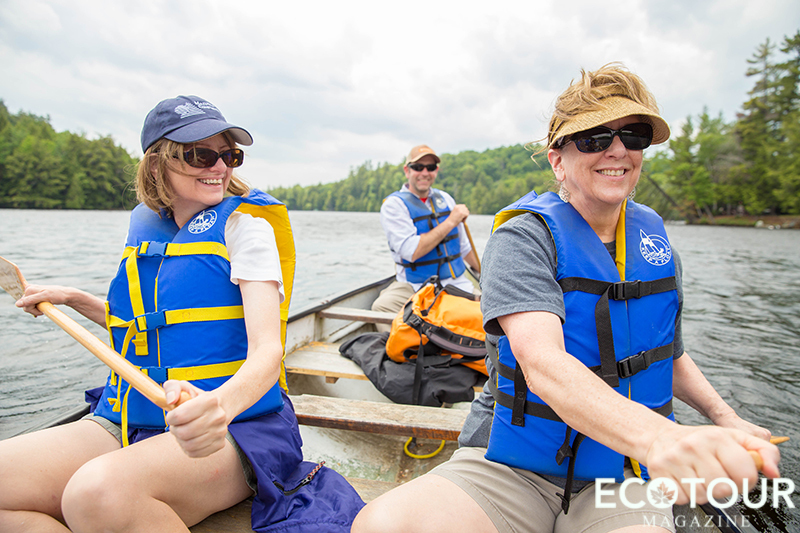 During our canoe-ride, we learned about the surrounding wildlife, which included the white tailed deer, moose, bear and wolf. Cameron reminded us that the Haliburton Forest is not a safari park, so seeing wildlife is considered a bonus. 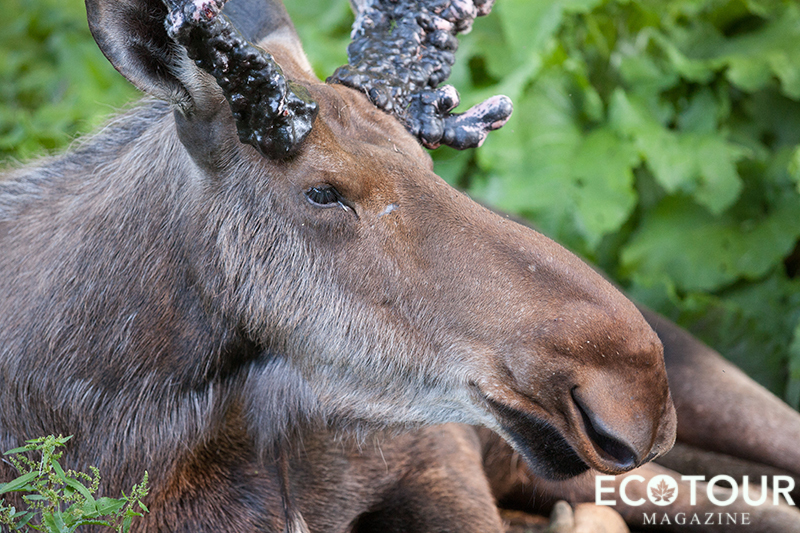 However, if you want to guarantee yourself some animal visits, I’d recommend taking a walk to see the forest’s resident animals after the tour at Basecamp, where we visited Hershe, the resident moose. Hershe is an orphan. In early June of 2011, his mother was killed in a vehicle accident near Pembroke, resulting in the orphaning of Hershe and his sibling calf at just 3-weeks old, at which point they were transferred to the Haliburton Forest. 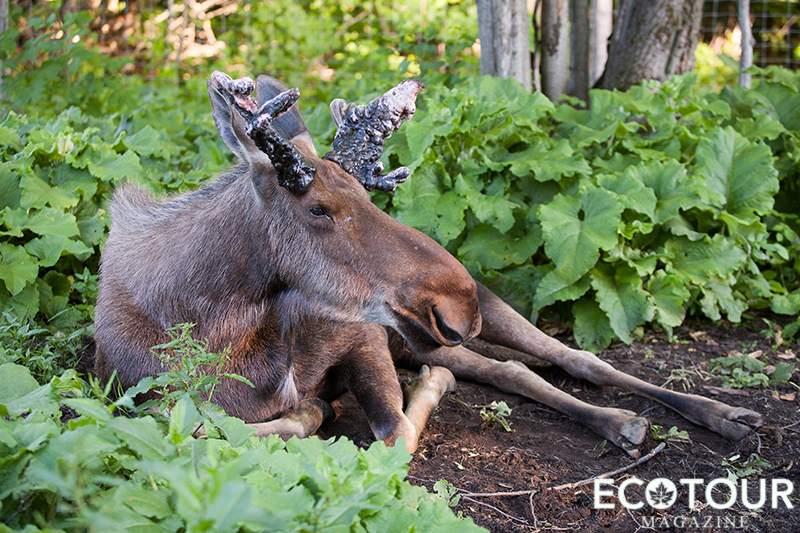 Unfortunately, the other calf passed away, but Hershe defied all odds, and developed into a full-grown, and healthy moose who eats over 50 lbs of fresh leaves and twigs daily, and who loves company, whether it be from people, horses, or dogs. Cameron told us the miracle story of Hershe, and the confusion of the calf arriving as a female, and then he turned out to be a young bull. With this confusion, the staff would ask whether the calf was a “she”, a “he”, a “him”, or “her”, and thus, the name “Hershe” came about. We listened carefully as our guides introduced us to our safety standard equipment. 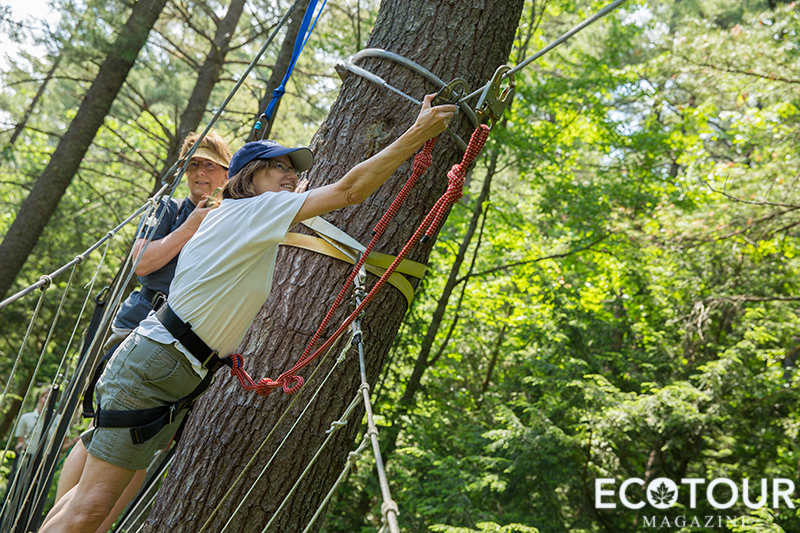 Each person received a comfortable harness, and practiced hooking and unhooking their gear on the forest floor’s practice course, before stepping out onto the boardwalk for our treetop tour. 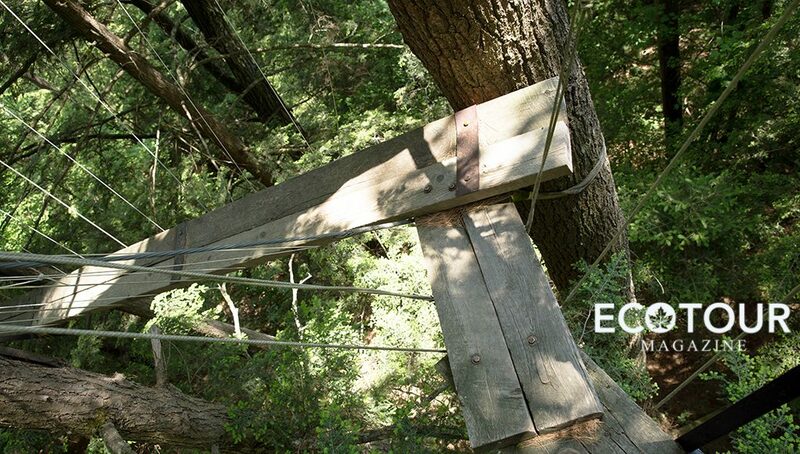 During our treetop tour, we learned about the boardwalk’s sustainable design in how it was built. 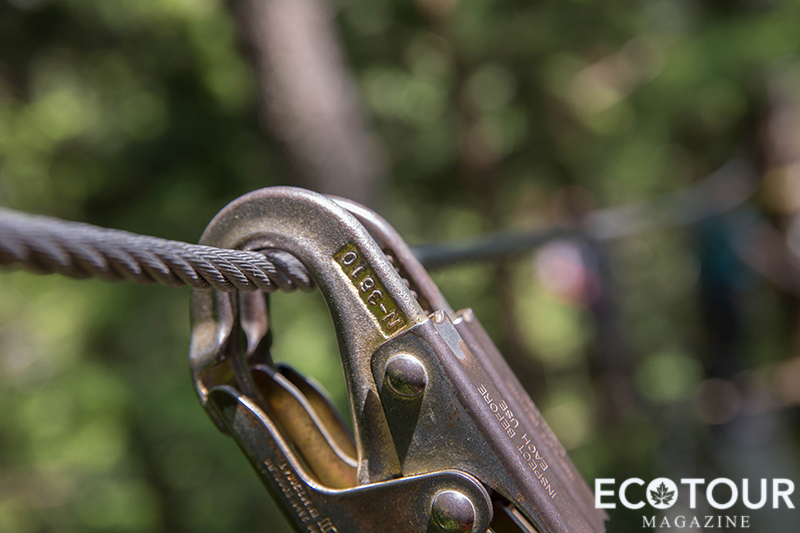 Our guides told us that the wooden planks were attached in a way, so that they could be taken down from treetops if needed, without causing any damage to the trees. Along the way, Cameron engaged our group in lively discussions about the trees that we encountered on our walk, such as Beach trees that make up about 50% of the forest, Hemlock trees that are popular among woodpeckers looking for insects, and White Pine, the iconic trees of Canada famously seen in images of logs floating across the St. Lawrence and Ottawa River. 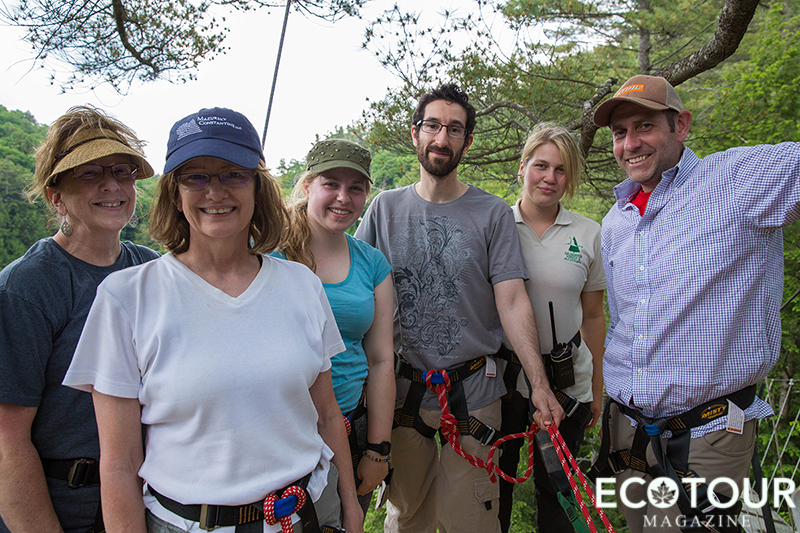 About halfway along our treetop tour, our group gathered on a large tree platform to reflect on the nature around us. Normally, this is when groups have a snack, but since we knew a storm was coming in the late afternoon, we saved our snack for the end, just to be safe. 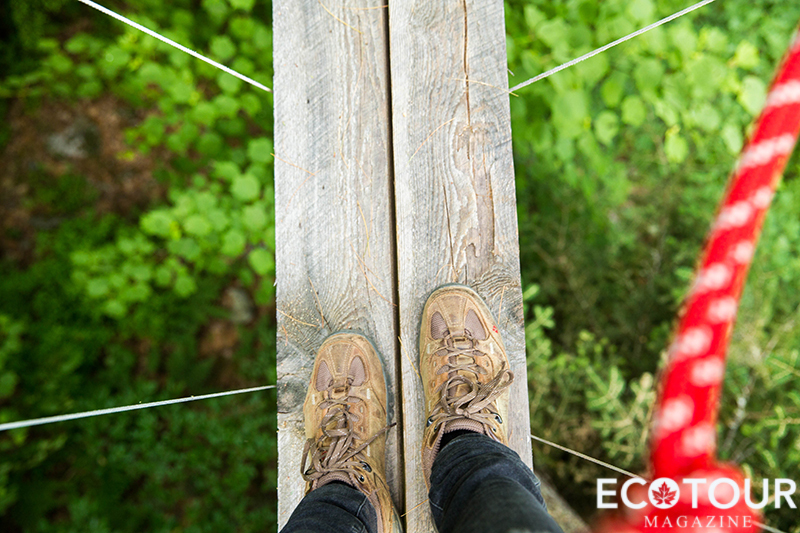 Regardless, our time on the platform was a wonderful experience, with panoramic views of the pristine forest floor. 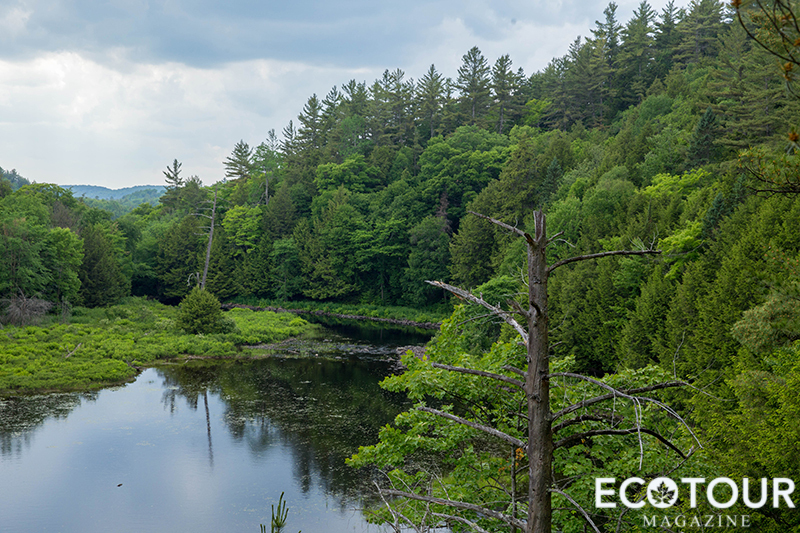 We were on the southwest of what is called the Algonquin Dome, an elevated piece of the Canadian Shield, which forms Algonquin and the Haliburton Highlands. 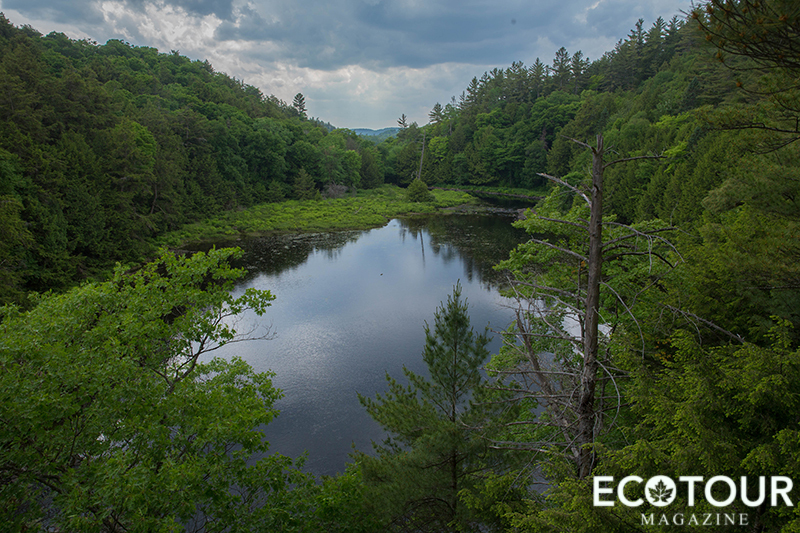 From our birds-eye view above, we saw many of the Algonquin Dome’s broad leaf species of tree, interspersed with White Pine. Looking around, we could see many of the forest’s crystal-blue lakes and vast wetlands. 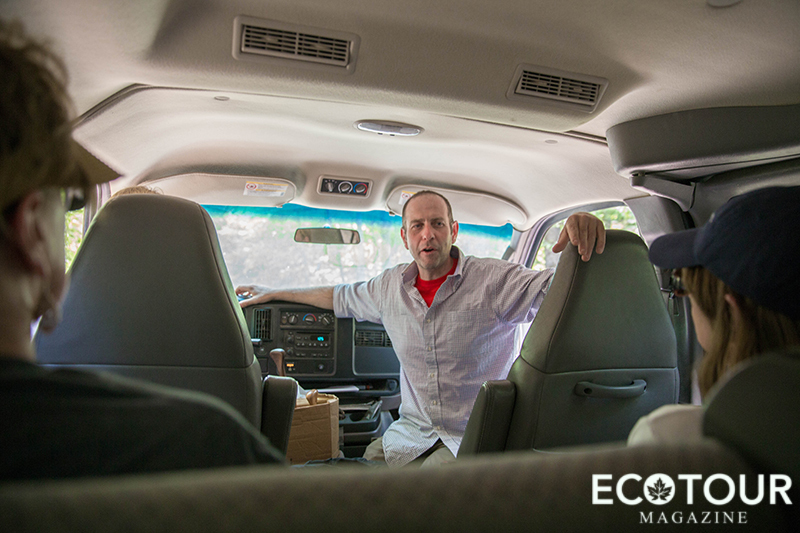 This tour was very interactive and conversational, so if you are the type who likes open discussions and learning, then this tour is for you. 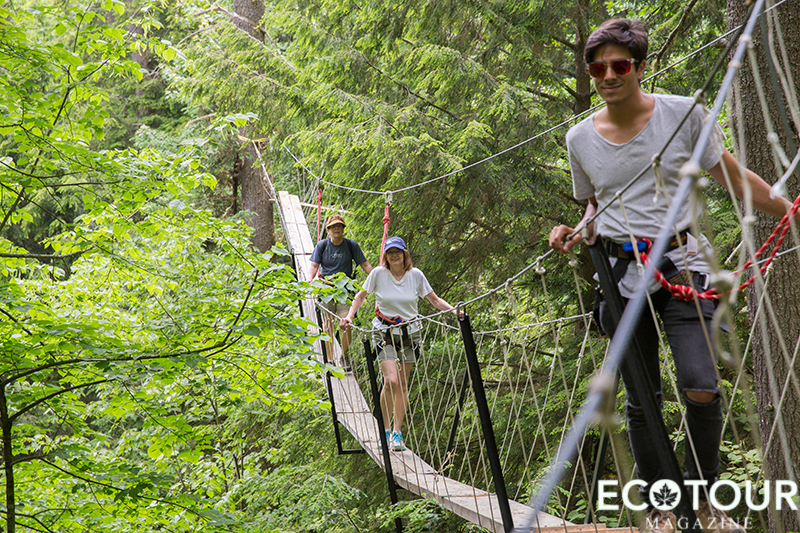 I was impressed with the environmental initiatives we learned about, from Peter’s sustainable canopy tour design, to the excellent nature interpretive guides who taught us about the forest’s history, nature, and wildlife. 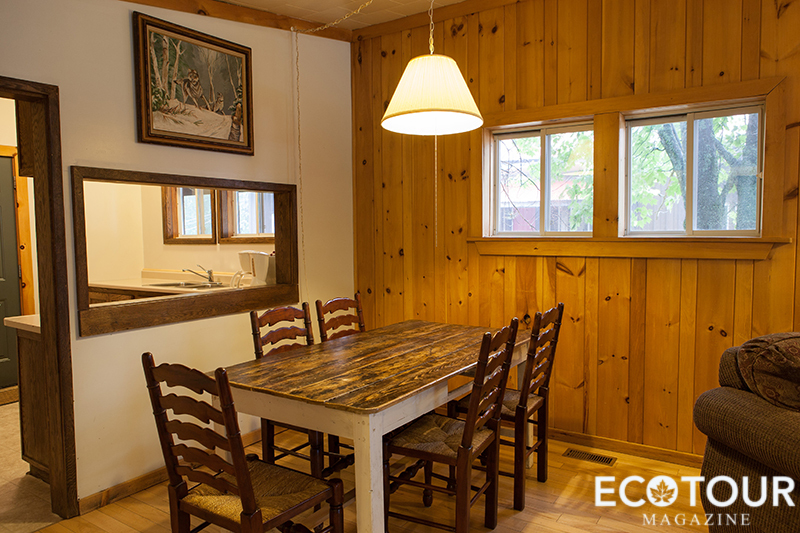 There are housekeeping units and log cabins on-site. 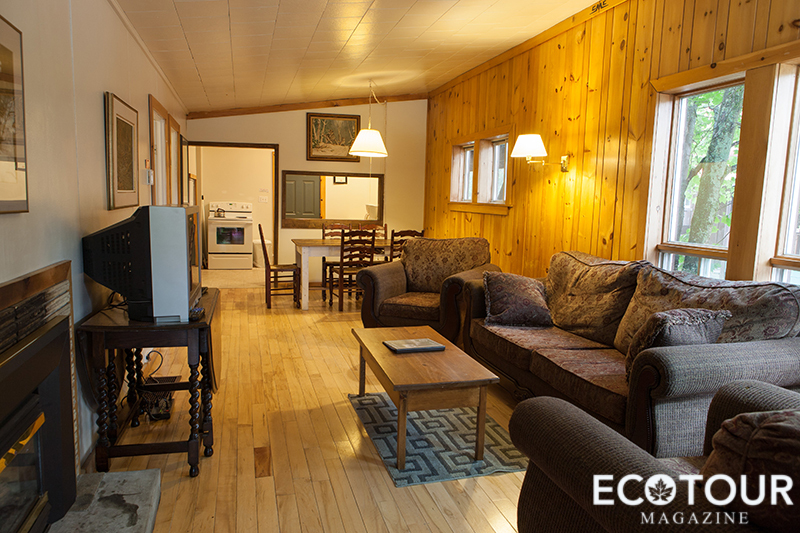 We stayed at the Bear Den, which provided us with a comfortable living space, propane fireplace, full kitchen, dining area, television with satellite channels & DVD player, and a 3-piece bathroom, starting at $75 per adult and $37.50 per youth + HST. 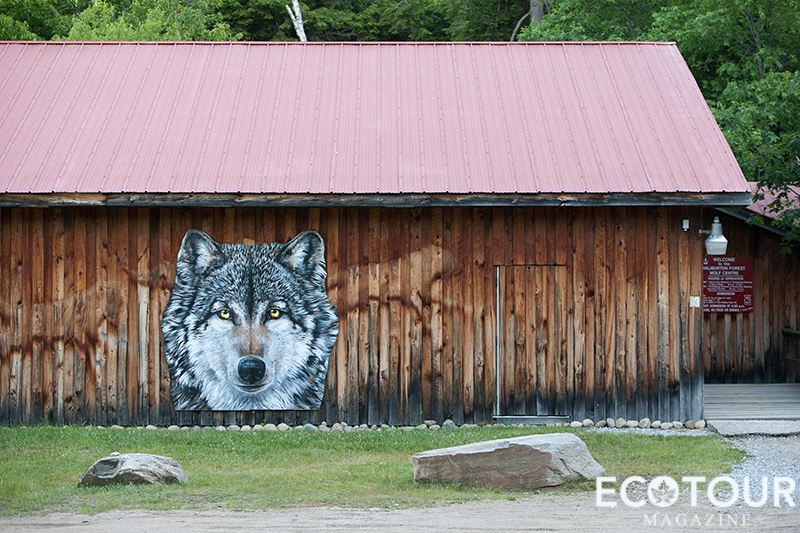 There is included admission to the Wolf Centre, where you can observe wolves roaming freely in a 15-acre enclosure, with your Canopy Tour ticket purchase, at $95 per adult, or $70 for youth over 10 + HST. Group rates are also available. 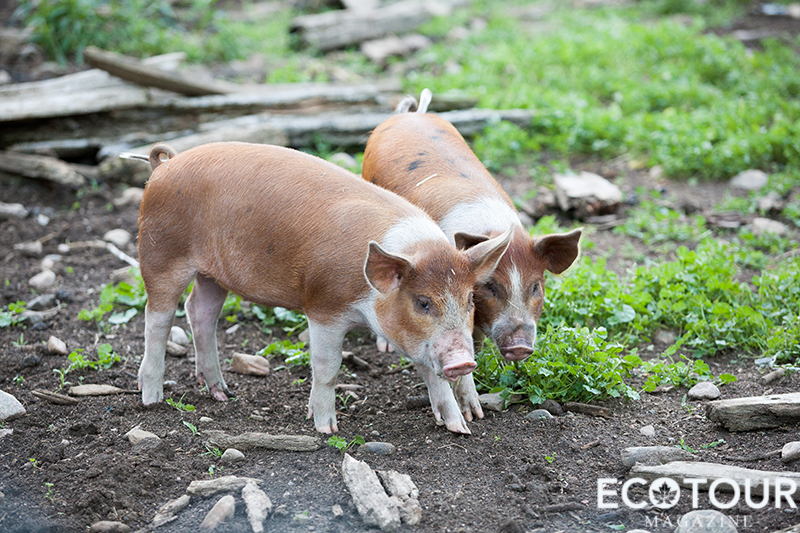 There’s also other farm animals to visit on property, free of charge. It’s important to read the weather forecast before your tour and dress appropriately, as this tour runs from summer into the cooler months of fall. Also, be sure to wear closed toed shoes because sandals aren’t allowed for safety reasons. And of course, have fun! 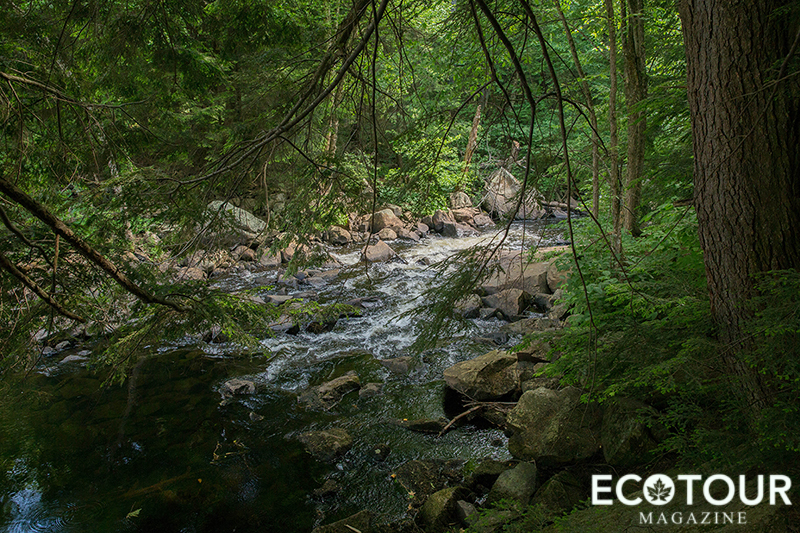 Haliburton Forest and Wild Life Reserve Ltd., or simply Haliburton Forest, is a unique, privately owned forest located on 70,000 acres of rolling hardwood forests, beautiful lakes, meandering rivers and extensive wetlands in the Haliburton Highlands. 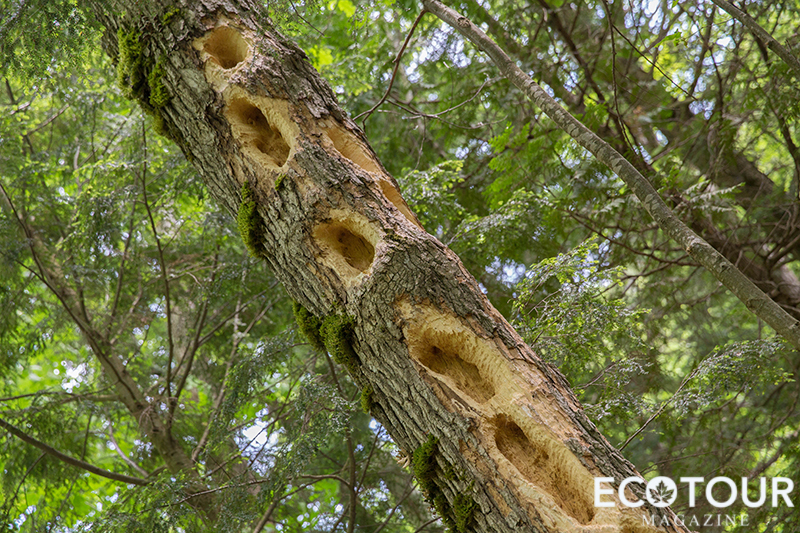 You can read more about the Haliburton Forest & Wildlife Reserve here. 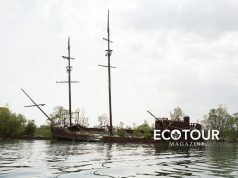 Remember that sharing is caring, and each article shared helps support our cause to raise awareness of eco-minded travel opportunities in Canada.